Manual Valls comes out in support of French Jewry and criticizes Danish attacks - former FM Dumas says he 'is biased' by Jewish wife. French Prime Minister Manuel Valls on Monday slammed the attacks in Denmark by Islamist terrorist Omar Abdel Hamid Hussein on Saturday, in which two people were murdered, as being an act of "Islamo-fascism." Responding to the attacks in Copenhagen and the attacks on Paris last month, Valls said "to combat Islamo-fascism, for that is what it should be called, our strength must come from unity," reports AFP. Valls also responded to Prime Minister Binyamin Netanyahu's call for European Jews to come home to Israel in the face of widespread anti-Semitism and violence on the continent, noting Netanyahu is "in the middle of an election campaign." 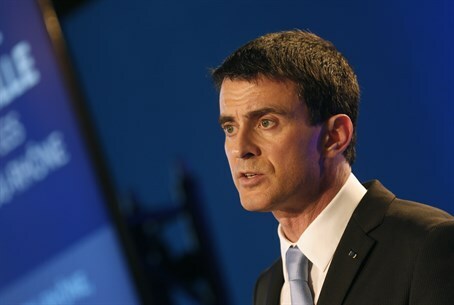 "The place for French Jews is France," stressed Valls. France has been named as the West's most dangerous country for Jews, and anti-Semitism doubled there in 2014. In response to the massive vandalism attack on Jewish graves in the region of Sarre-Union in Alsace on Monday, Valls condemned it as "an anti-Semitic and ignoble act." After Valls made his comments calling on Jews to stay and criticizing "Islamo-fascism," former foreign minister Roland Dumas was asked in a radio interview on BFMTV whether the prime minister was "under Jewish influence." "Probably, he has personal relations that cause him to be biased. Everyone knows that he is married to someone, a respected person, by the way, who has influence over him," said Dumas, in an apparent allusion to Valls' Jewish wife, Anne Gravoin. Striking back at Dumas's statement, National Assembly president Claude Bartolone tweeted that he was “repulsed” by it, saying the statements "reveal an ordinary anti-Semitism" and absurd conspiracy theories. France is home to Europe's largest Jewish population and also the continent's largest Muslim population, although it is difficult to give precise figures as the French state is officially secular and does not collect data based on religion. Some 851 anti-Semitic acts were registered in 2014, compared with 423 the previous year, with acts of physical violence jumping to 241 from 105, the CRIF French Jewish organization said.